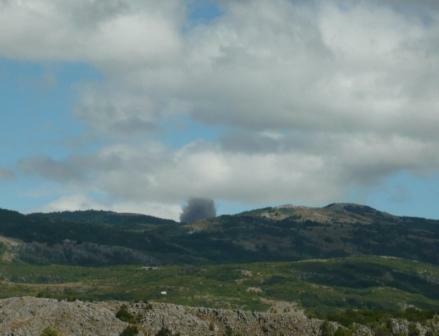 The local people and environment of the Montenegrin Mountain Golija experienced many negative effects of destruction of ammunition surplus conducted under the Montenegro Demilitarization (MONDEM) program. After independence in 2006, Montenegro had over 12,000 tonnes of ordnance in military depots. Nearly 9,800 tonnes of this ordnance represents a surplus and has once belonged to the former Yugoslav army. This ammunition, some of it 20 to 40 years old, is well past the expiration date, and as it has started degrading, becomes unstable. In the area of Nikšić Municipality, the Montenegrin army has so far destroyed around 2,000 tonnes of weapons. Delaboration of ammunition (disassembling into its component parts) was conducted in the facilities of the Booster Company from Nikšić, and detonations to destroy the component parts were made on the polygons of Pusti Lisac, Prage and Latično – Golija. This region corresponds to the Montenegrin Mountain Golija and it is in proximity to the national border with Republic of Srpska (Bosnia and Herzegovina). The destruction is conducted as a part of the Montenegro Demilitarization (MONDEM) program and a technical agreement on the destruction of small arms and light weapons and various types of ammunition, signed between the Montenegrin Ministry of defense and the US State Department. Further finance for reducing surplus stockpiles of weapons in the country was provided from melting down military tanks in the steel factory in Nikšić and selling the precious steel. Local residents were persistent in their efforts to stop the further destruction of ammunition in their municipality due to the many effects they have been experiencing. Beside the scorched land, noise and damages of the nearby houses, many people had to move their cattle from the area as the sources of water have been dripped out due to the detonation. The soil in the area got contaminated with heavy metals and therefore resulted in a visible absence of plant and animal life. Local people organized petitions, protests, protest walks, and road blockades. In August 2010 more than 20 people were arrested in clashes with the military and civilian police and charged for violating the public order. At some of the localities people managed to stop further action, however destruction continued in some locations. At some point, the Ministry of Defense offered compensation to the local people, however no compensation was ever paid. 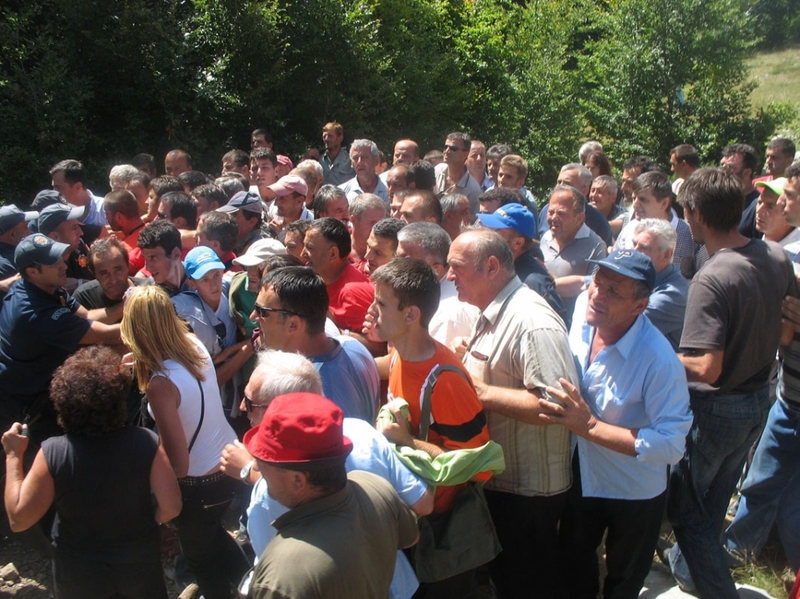 The local communities from the neighboring Republic of Srpska raised their voice against these activities asking from the Government of Bosnia and Herzegovina to demand the Montenegrin government to move the activities away from the national border. The NGO Ozon and The Network for Affirmation of NGO Sector (MANS) supported the local people by sending an initiative to the Montenegrin Committee on Security and Defense and the Committee for Human Rights. The Center for Eco-toxicology Investigation (CETI) from Podgorica and Vinča institute from Belgrade found increased concentration of heavy metals in the soil; however they claimed that the pollution was present in the soil even before the detonations started due to the proximity of industries and highway. Since the lack of information on the type of weapons and its chemical composition, local people suspect that the Army of Montenegro were also destroying uranium enriched munitions. The Government of Montenegro refuted these statements. Local people demanded from the Montenegrin Government to change the procedure and find another location for destruction of military waste in a decision-making process including participation of the civil sector. 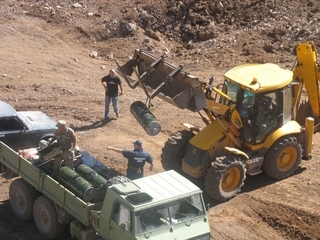 In May 2012, the Montenegrin Ministry of Defense announced the end of the activities of waste destruction in the municipality of Nikšić, and changes in the procedure of destruction of the surplus of ammunition according to the models used in developed countries that would be continued with the donation of 2,000,000 USD from the US Government. The NGO Ozon demanded higher participation of the general public in the discussions on the environmental issues, and changes in the Law on the Environmental Impact Assessment to include EIA study as a requirement to perform the activities of military waste destruction. The Ministry of Defense accepted the opponents demand to send ammunition for demolition to the specialized factories in the region. However, there is no information if this is really happening. MONDEM program is ongoing until 2017 and includes “environmentally-friendly demilitarization process”. Project Details In the area of Nikšić municipality, a total 892.3 tonnes of ammunition has been destroyed so far, of which 330.94 by detonation and 561.33 by delaboration. Detonations were made at three locations - Pusti Lisac (43.5 tonnes), in Prage (40.56 tonnes) and Latično - Golija (246.88 tonnes). In military warehouses in Montenegro, in 2006-2007, there were 12,500 tonnes of surplus weapons and ammunition and so far 4,500 tonnes were destroyed. These activities are conducted through MONDEM program and are financed by UNDP and the OSCE, and through the technical agreement and the government's resources (first phase 230,000 USD, and second phase 350,000 USD). There are now eight warehouses in Montenegro: Brezovik, Taras, Golubovci, Nova lokacija – Pljevlja, Sasovići, Opatovo, Petrovići i Pristan, and it is planned that at the end of the program only the first three will remain. Until beginning of 2016, Montenegro has destroyed 1,542 tons of excess ammunition that represents 80% of the planned amount. Development of Alternatives The citizens demanded destruction of the surplus of weapons elsewhere, preferably in specialized factories abroad. They also asked for changes in The Law on the Environmental Impact Assessment to include the requirement of EIA for the projects of incineration of military waste, and an improved communication of the issue with the general public. Why? Explain briefly. Event though, the Montenegrin Ministry of Defense decided to destroy the surplus ammunition by delaboration and offer the part that cannot be safely destroyed to the specialized factories abroad, there is no information if this is really happening. MONDEM project is ongoing and it will be prolonged until 2017. The authorities claim that the project includes an environmentally-friendly demilitarization process.